Wed, 28/01/2015 - 12:08 Nicolas R.
Last week, on the 20th and 21st of January, I attended Mobile Game Conference with software engineer Céline Boudier. As you can guess from the name, it's a conference that takes place during the London Games Week and that focuses on mobile gaming and gathered the whole ecosystem: game developers, studios, monetization services, infrastructures and so on. Basically, they invited Joan Da Silva for the talk. He was previously working for Rovio, had a talk last year and the organizers wanted to have him back on stage this year to talk about what he does with robots with his kind of background. But it turned out that Joan couldn't make it. Since neither Céline or myself have real experience in the video game industry (except for the client side I guess :D), we decided to explain why robots need game designers. If you are interested, you can see our slides below. Both Céline and myself are thankful to the teams which helped us creating this talk: Joan Da Silva of course, but also the dialog team, UX team and some others. On the second day, Céline and I went back to MGF, for some meetings scheduled the day before. 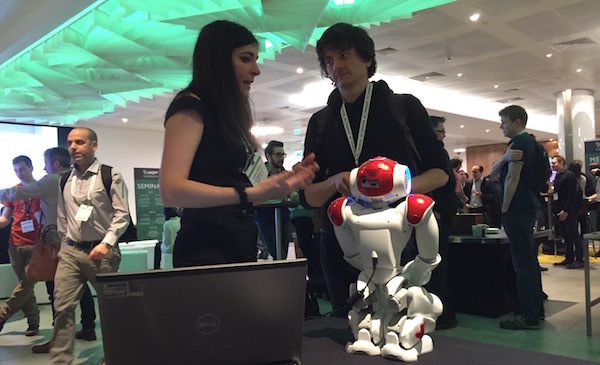 The organizers offered an opportunity to demonstrate NAO at the beginning of another talk, and they also provided us with a booth on the exhibitor space, so as to be able to have our meetings and to do some programming demonstrations. For boys and girls. This event was by the end a nice success. We've had a lot of positive feedbacks on social networks, and some nice discussions with a few studios could lead to interesting stories. Of course, we don't have a lot of games to showcase at the moment. 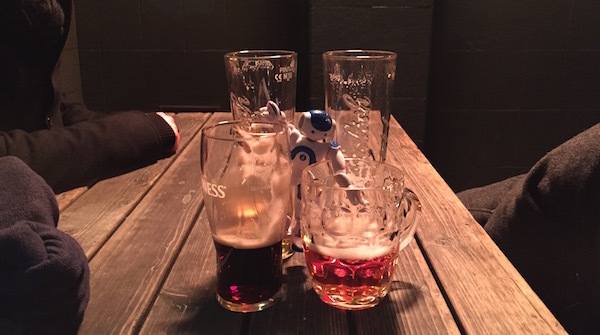 All we have available are the apps for ASK NAO. But anyway, we've been able to sense a real interest for these new generation of devices that robots represent. How can you play with a robot? Well, I think there are lots of things to invent: playing with NAO (NAO being the master of the game, think about board RPG for example), playing against NAO (think about the connect 4) or, paired with other devices like an oculus for instance, we could even think of playing through NAO. 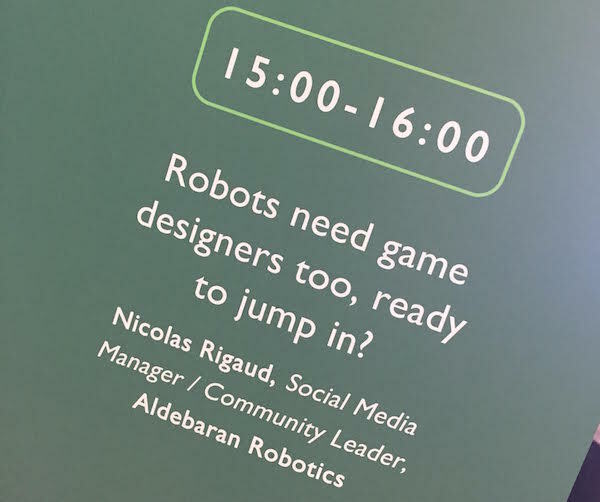 This conference was also an opportunity to think about games for several robots. 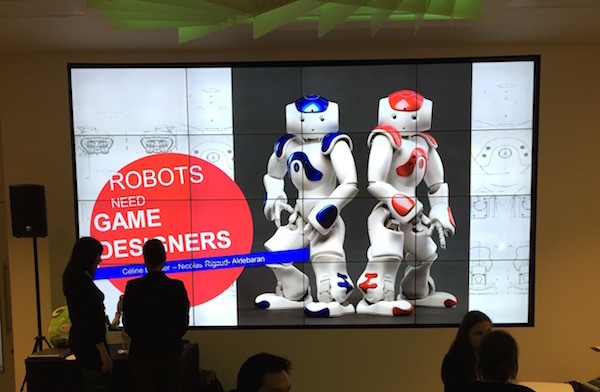 I mean, apart from the Robocup, who's been working on games including several robots so far? I think there's really a lot to think / prototype / test. What about you? What kind of game would you create for our robots (assuming you got the necessary skills for that)? Are games even a topic of interest for you when it comes to NAO?